"that their light may always shine . 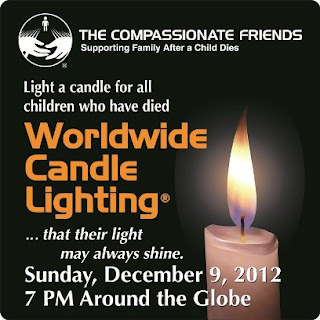 . . "
Today is the Compassionate Friends Worldwide Candle Lighting in memory of all children who have died no matter the age, cause, or location. You don't have to attend a service to participate. Just light a candle for an hour wherever you are with friends, family, or in quiet solitude. To find the service nearest you, whether in the U.S. or another country around the world, click here and look for the link. You can post a tribute to your child or loved one in the online Remembrance Book here. Follow along with Compassionate Friends on their facebook page. Please pass this information along to your family and friends. For my local friends, there is a ceremony in Apex, North Carolina (details below) if you are interested. Children are honored that are lost from infancy up to adulthood. My grandmother attends the CF Candle Lighting in my hometown in Virginia. I have been with her and it is a truly beautiful, special service. Highlights: Reading of children's names and memory sharing, hand bell choir, and special music. Bring: Please bring pictures of your children in frames which will stand or a small remembrance and a snack to share after the ceremony. 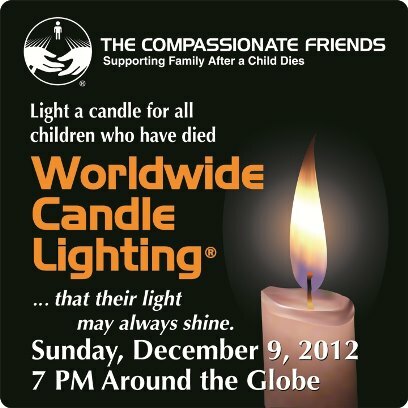 You may also bring a small candle in a glass container or get one for a small donation, to help cover the cost, when you sign in. Special Events (after): There will be a time to share food, mingle with other bereaved family members, and share memories of your children with others immediately following the ceremony.